This really is a book you shouldn't judge by its cover! Cause the cover is just blah and a bit boring and more western looking and the story, OMG, it was AMAZING! Based on the cover I would have expected cowboys (I'm not really sure why) and this book was so absolutely wonderful and was certainly not a western. Not that there's anything wrong with that, it's just not my thing. I loved the storytelling! Somewhere along the first chapters I got the feeling there'd been another story set in the same world and as it turns out, the author wrote a trilogy I think is about the main character's parents. But while we don't know everything that happened there, this doesn't take anything away from the storyline. I loved Ember! She's a strong girl and she learns a lot along the way. She's very brave and stands up for those she loves, I could feel her pain and so wanted everything to work out for her. And Ash, gosh, he's wonderful. You really need to read this book for yourself, but Ash will stay in my head for some time to come. He's not the most handsome man around, but his personality is beautiful. I really need my happily ever after! 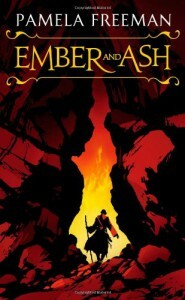 I need more Ember and Ash together, the ending left me feeling sad and going: NOOO! They HAVE to be together! I got sucked into this story from the very first page. If you like fantasy and are looking for a good story: READ THIS BOOK! I absolutely loved it!